A Dehydro is an emergency pumping kit which has a powerful pump, 2x packs of FloodSax Door and discharge hoses for defending a property from flooding. Depending on which kit is selected, the pump is designed to pump water levels down to a level of between 3mm and 1mm. Hoses are light, easy to position and feature quick connections to enable fast deployment in an emergency. Supplied in a sturdy easy-carry case, there is sufficient space within to not only store the pumping equipment, but keep other flood protection products e.g. emergency grab bags, emergency meals etc. 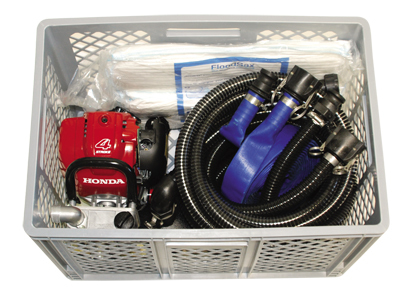 Dehydro 3 kit contains 1x WX10 Honda engine driven pump, with a 1.5HP engine and weighs 6kgs (dry). This is supplied with a quick release discharge connector, a 4 metre, quick release suction hose, and a low level suction tool. It will pump approximately 80 litres per minute across 30 metres of level ground, when using 25mm (1”) hose. Initial priming of the pump with water is required before starting, It will pump water down to 3mm, but it must not run dry. Ideal for use when mains power is not available.